By Sharon Danitschek. Discovered by Player FM and our community — copyright is owned by the publisher, not Player FM, and audio streamed directly from their servers. 121 episodes available. A new episode about every 12 days . The Kissing Sailor is one of the most iconic photographs in American History. Veteran Hal Burke stops by MRN Radio to talk about his friend George Mendonza and how the photograph came to be. show sponsor: Best Western Merry Manor The_Story_Behind_The_Kissing_Sailor.mp3By info@radioactivebroadcasting.com (Sharon Danitschek). Hospitality as big as the state of Texas! Mike Bugara, Navy Veteran and seasoned reunion planner talks about the fun, friendship and sometimes frustration related to planning a military reunion. A_passion_for_planning.mp3By info@radioactivebroadcasting.com (Sharon Danitschek). We sat down with Geoff Gadisky to hear more about the new additions to the museum and why it is such a special place to visit. Today's show is sponsored by The Branson Lakes Area Convention and Visitors Bureau. Geoff_Gadisky_With_Branson_Military_Museum.mp3By info@radioactivebroadcasting.com (Sharon Danitschek). Iraq Veteran Elliott McKenzie shares how his passion and talent for music helped him. Now, through his songs, his goal is to help other warfighters. Elliott_McKenzie_on_MRN.mp3By info@radioactivebroadcasting.com (Sharon Danitschek). A Mother Knows! 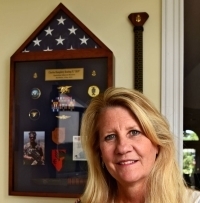 When her son,Navy Seal Charles Keating ,was killed in action she had the feeling in her heart he was gone. What will never end is a mothers love and the way she keeps his memory alive. Big-Hearted Charlie Runs the Mile Veterans_Day_Specials_1.mp3By info@radioactivebroadcasting.com (Sharon Danitschek). How do you personally thank over 6 million veterans for their service and sacrifice? This is the mission of the Vietnam War Commemoration for the next seven years. Learn why this mission is so critical and how to be involved! Thanking_Over_6_Million_Veterans.mp3By info@radioactivebroadcasting.com (Sharon Danitschek). Is Knoxville the place for your next Reunion? I think it could be. Today you will find out all you need to know about this amazing place, and all it has to offer. Hello_Knoxville_1.mp3By info@radioactivebroadcasting.com (Sharon Danitschek). Pigeon Forge for a reunion? ABSOLUTELY! Michael McElroy Group Sales Manager at Fee/Hedrick Family Entertainment shares why Pigeon Forge is a great option to places like Branson. If your reunion loves live entertainment, you will love Pigeon Forge. find out more at Military Reunion Network. Pigeon_Forge_for_a_reunion_ABSOLUTELY.mp3By info@radioactivebroadcasting.com (Sharon Danitschek). Hear all you need to know about taking your Reunion to Seattle Off_to_the_Emerald_City.mp3By info@radioactivebroadcasting.com (Sharon Danitschek). Sharon Talks with Melanie Thomas about the wonders of New Orleans and La Quinta Hotel where she works in the heart of it all. listen as she gives us some in site to this great city. New_Orleans_La_Quinta.mp3By info@radioactivebroadcasting.com (Sharon Danitschek). More with Boone Cutler Boone_Cutler_part_2.mp3By info@radioactivebroadcasting.com (Sharon Danitschek). Cleo DeLoner continuous her powerful story. MRN_with_Cleo_part_2_1.mp3By info@radioactivebroadcasting.com (Sharon Danitschek). Camp4Heroes is a place for our heroes to re-purpose their lives in any way that they choose at there beautiful compound by enjoying various activities, and engaging in fellowship with others who understand the difficulties and hardships of readjusting bat to civilian live. Camp_4_Heroes.mp3By info@radioactivebroadcasting.com (Sharon Danitschek). A Reunion in Waterloo Iowa ABSOLUTELY!!! Bill Johnson or Bob Hope? Founded in 2012, Sergeant Colton Levi Derr Foundation (SCLDF) is steadfast in our three fold mission: Veteran Advocacy, Assistance and public Awareness of the battles our heroes face when they come home. sergeantderrfoundation.org facebook Sgt_Colton_Levi_Derr_Foundation.mp3By info@radioactivebroadcasting.com (Sharon Danitschek). Jim Wertman AKA Santa and his 1,600 "Reindeer"
Start listening to Military Reunion Network Radio Show on your phone right now with Player FM's free mobile app, the best podcasting experience on both iPhone and Android. Your subcriptions will sync with your account on this website too. Podcast smart and easy with the app that refuses to compromise. A podcast devoted to telling the world about Vietnam Veteran news, issues, interviews and commentary.